As some of us pat ourselves on the back for nailing a percent-change calculation, there are people out there — young people — who are solving problems I can’t begin to describe. Laura Pierson, a 12(! )-year-old who goes to Oakland Unified’s Hillcrest School, is one of them. 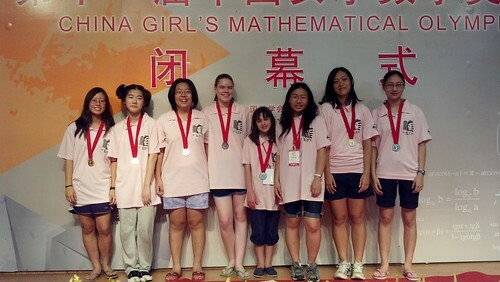 Laura was the youngest person to compete with Team USA in the China Girls Mathematical Olympiad; she won a silver medal in the contest and returns to home tomorrow. Each day, 204 girls from 10 countries had four hours to tackle four problems. I’ll post the test — provided by the Berkeley-based Mathematical Sciences Research Institute — below. So this morning we had Recurrences and Graph Theory, both of which were really cool! Pretty much all math is really cool. Except geometry, which I’m terrible at. (Actually I’m terrible at pretty much everything…) This afternoon we had a class called Smooth Fudge. We were joking that it should teach us to “fudge” our geometry diagrams using things like the Big Dot Theorem and the Circumpotato of an arbitrary polygon. It turned out to be this technique for solving inequalities though. It was still pretty cool. Overall MOP has been a lot of fun. I’ve learned so much and I’ve actually met people who share my passions and don’t think I’m crazy for wanting to spend a month of my summer doing math. It’s actually past midnight now, so goodnight (morning?)! Congratulations to Oakland’s extremely un-terrible math whiz, who will soon start seventh grade. I wonder: What do teachers do to challenge her — and others like her? Anyone else up to the Olympiad challenge? If so, I have the answer key, which I can post later this week.